This is when spondylolisthesis is due to a birth defect, such as spina bifida and scoliosis, and accounts for about 20% of all treated cases. 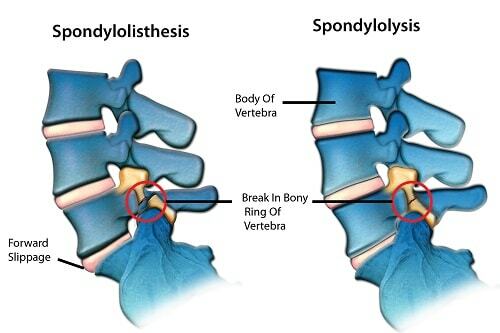 This is when spondylolisthesis results from the progression of another related spinal disorder and source of lower back pain, called spondylolysis. Spondylolysis is caused by a bone defect, for example, a stress fracture, in the region of the vertebra called the “pars interarticularis” that forms the joint in the spine. It typically occurs in the lumbar vertebra and is the most common cause of lower back pain in children and adolescents. Frequently, sporting activities such as diving, weightlifting, and gymnastics are the cause, but it is also common for the cause to be unknown. Spondylolysis has a prevalence rate of about 6 – 11.5% in the general population, and 7-8% in elite athletes. These figures, however, are suspected to be an underestimation of the actual prevalence of the disorder. Also, up to 50% of cases of lower back pain in athletes have been attributed to spondylolysis. This is the most common type of spondylolisthesis found in adults. This is when spondylolisthesis is due to chronic degeneration, and is usually seen in persons over 50 years. It is oftentimes caused by arthritis and is diagnosed in females about five times more than in males. This is when spinal destabilization is due to an acute trauma. This is when spondylolisthesis is due to a disease that affects the bones. This occurs from complications due to surgery, with an incident rate of about 3-5% of all treated spondylolisthesis. Congenitally dysplastic joints. Children born with underdeveloped facet joints in the spine may experience the forward slippage of a vertebra. This can also cause compression of a nerve. Hyperextension of the lumbar spine. This is usually the cause for the progression of spondylolysis to spondylolisthesis. Hyperextension can be due to weak pars interarticularis, abnormal bone healing or trauma. The latter is usually seen in persons that take part in impact sports that predispose them to stress fractures. 40% of athletes with spondylolysis have a history of back injury. Degenerative bone disease. Degenerative bone diseases, such as arthritis, that result in instability in the vertebra can lead to slippage. Trauma can lead to fractures and dislocation of various components of the spine. Women are four times more likely to develop spondylolysis than men. Family history. There is an increased incidence rate in first degree (parent, sibling or child) family relatives. Caucasians have a higher incidence rate (6%) than African Americans (1.5%). Eskimos have a very high incidence rate of 25-50%, indicating that there exists a genetic component. Diagnosis is usually made from a physical examination, as well as an X-ray examination of the spine to see if a vertebra is out of place. X-ray should be done with the patient standing instead of lying down because the degree of slippage increases to 26% when standing versus lying down. Appropriate treatment is dependent on the degree of dislocation as well as the age of the patient. In young patients where the skeleton has not fully matured and degree of slippage is grade I or II, conservative treatment should be the first option. This includes lifestyle modification, physical therapy, and drug therapy. Patients should follow up every 6 to 12 months until skeleton has fully matured, after which it is very unlikely that the slippage will progress. For skeletally immature patients with grade III and IV spondylolisthesis, surgical intervention is recommended because slippage is progressive and needs to be stabilized. Whether or not adults with spondylolisthesis need surgery is completely dependent on the symptoms, and not the severity of the slippage or its nature, except for pathologic spondylolisthesis where the form of treatment is dependent on the underlying disease causing it. Jacob, E. (2013) Medifocus Guidebook on Spondylolisthesis, Medifocus.com, Inc.
 Garet, M., Reiman, M. P., Mathers, J., and Sylvain, J. (2013) Nonoperative treatment in lumbar spondylolysis and spondylolisthesis: a systematic review, Sports Health 5, 225-232. Omidi-Kashani, F., Ebrahimzadeh, M. H., and Salari, S. (2014) Lumbar spondylolysis and spondylolytic spondylolisthesis: who should be have surgery? An algorithmic approach, Asian Spine J 8, 856-863.